High Wycombe, UK, 14 February 2019 - At EuroCIS 2019 (19 - 21 February, Messe Düsseldorf, Germany), Star Micronics will be demonstrating the future of POS connectivity with pioneering solutions from leading software partners bitbakers (Flour.io), INVENTORUM, iZettle and Posmatic on Stand 9/A14. Star is widely acknowledged as the leading hardware innovator in the move from more expensive traditional POS terminals to Cloud connected tablet POS featuring lower cost hardware that can be mobile or fixed and easily upgradable as the business grows. Coupled with Cloud connected software that is flexible, low cost and progressively scalable according to market developments and individual business needs, tablet POS is being increasingly chosen over traditional POS across retail and hospitality. Up to now making the transition to Cloud-based tablet POS has been expensive, particularly for small to medium-sized retailers. Recognising this, Star has developed the mC-Print™ series featuring 58mm and 80mm print width models with a multiple POS peripheral Hub - all at a much lower cost than previously available on the market. With the unique functionality of 5 interfaces for both traditional and tablet POS, the mC-Print series meets the needs of an evolving multichannel environment. Offering Star CloudPRNT™ technology for remote PC-free printing of receipts and tickets directly from a web server to Star mC-Print2 or mC-Print3 printers located anywhere in the world, this low cost and versatile Cloud printing solution is ideal for applications across retail and hospitality including Click & Collect in-store orders, event ticketing and online food ordering, etc. The entire mC-Print series is cloud-ready including the entry-level, lowest cost 58mm mCP20 with LAN and USB interfaces. Star’s mCP21 LB (LAN, Bluetooth, USB, iOS USB, Cloud) and mCP31 L (LAN, USB, iOS USB, Cloud) and mCP31 LB (LAN, Bluetooth, USB, iOS USB, Cloud) models feature 2 USB host ports for local or cloud-based peripheral control of Star’s SCD222 customer display and / or Star’s 1D barcode scanner or the Symbol / Zebra DS9208 2D barcode scanner. Furthermore, the new mC-Sound™ offers users an audible sound device that can be used with any Star POS printer. With a compact design and high sound quality, mC-Sound is available with a choice of up to 16 different pre-programmed alerts plus user defined audio for a range of environments. Demonstrating Star’s keen focus on connectivity, retailers can today purchase a Star TSP654II with a traditional interface in the knowledge that it is future-proofed for whatever cloud strategy the retailer wants to adopt and provides an easy, affordable upgrade by simply replacing the traditional interface with the HI X interface. The interface can also be used with other Star printer models that offer 80/112mm label, ticket and receipt printing - TSP743II and TSP847II as well as SP700 matrix printer. Alternatively, the TSP654II HI X Connect receipt printer is ready for the Cloud with the interface built in. Both solutions offer intelligent printing for modern Cloud hospitality applications and, in particular, online ordering. Star’s CloudPRNT-POS™ solution allows retailers to benefit from tablet POS with complete USB peripheral control from a web-based application on any device with a browser. While tablet POS offers the advantages of versatile Cloud-based software alongside compact low cost hardware, it has one disadvantage which is no connected peripheral control. Recognising this, Star has developed a solution that allows Cloud-based software to run on any tablet or smartphone (Windows, Android, Linux or iOS) with peripherals controlled through the printer to provide a complete POS transactional solution with all the advantages of tablet POS. The Star TSP654II CloudPRNT-POS can be used as a hub providing IP connectivity via wired Ethernet or WiFi with peripheral support, by means of 2 USB host ports with full status back. Star’s SCD222 customer display, 1D / 2D (Symbol) barcode scanners and cash drawers are the preferred peripherals and can be purchased via Star’s distributors. Connecting the Star printer and device to the same network creates a complete and connected tablet point of sale application that is easily accessible across any Internet enabled device. The latest addition to Star’s renowned TSP100 futurePRNT™ series is the TSP143IIIU. This printer, as well as Star’s mCP21LB, mCP31L and mCP31LB printers, has the unique ability to communicate and charge simultaneously and directly via the Apple supplied lightning cable with an iPad, iPod or iPhone for reliable USB communication. This removes the insecurity of wireless connection and seamlessly combines the flexibility and cost savings of tablet POS with the reliability of traditional POS. Providing the first receipt and ticket POS printers on the market to be Apple AirPrint certified, Star has launched the TSP654II AirPrint™ and TSP847II AirPrint with 58mm, 80mm and 112mm print widths. AirPrint provides easy mobile printing solutions for Apple iPad, iPhone, iPod and MacBook users on any private network with the key objective to be able to wirelessly print via the customer’s network without installing specific printer drivers. With AirPrint support pre-installed on iOS devices, the user is able to connect to and print from the required printer. Traditionally, AirPrint has been purely the domain of wider output inkjet and laser printers for business and personal use, but Apple has now confirmed its rightful place in the POS retail and hospitality sectors with its certification of the first AirPrint receipt and ticket printers from Star. Star’s TSP847II AirPrint is the latest addition to its unique multifunctional TSP800II series. Automatically printing A4 output on 112mm wide paper simply by selecting the TSP800 option within the native OS print function, the TSP847II AirPrint is a unique Apple iPad, iPhone, iPod A4 to virtual A6 replacement printer. With up to 90% lower running costs when compared with a typical A4 laser printer, the TSP847II AirPrint offers an effective low cost, space saving alternative for use with iOS devices. A large number of software partners have now integrated the cost-effective all-in-one tablet POS solution, mPOP™. A unique combined Bluetooth printer and cash drawer mobile point of purchase station mPOP is low cost and lightweight at just 10cm high and 30cm wide with a sleek design. With the POPPack option that includes a high quality black or white tablet stand (alternative colours are available if required) and metal plate, users can successfully create a stylish mPOS station. The POPPack design provides a flexible option with the extra security required within a busy retail environment, whilst retaining the mobile element. This provides the ability to securely store or transport the mPOS station at the end of trading. Founded in 1947, Star Micronics is one of the world's largest printer manufacturers and has facilities for worldwide production, marketing and support. 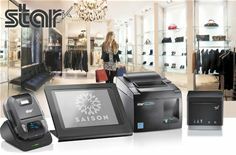 Employing over 1900 staff and achieving turnover in excess of £250 million, Star Micronics has developed a POS printer portfolio that spans thermal and dot matrix printers and mechanisms, designed for barcode, ticketing, receipts and labelling. Star's proven technology is also being utilised to install print mechanisms in multimedia kiosk environments. The Star Micronics' range is available internationally via a distribution channel comprising distributors and dealers.